Hiroshima Hana Hostel kohteessa Hiroshima, Japani: Varaa nyt! 5 minutes from Hiroshima station (370m, 404yd). This location is ideally convenient but is quiet because we are in the residential area. Everything you need, such as convenience store, grocery store, bank, foreign exchange, the post office, Okonomiyaki restaurant, cafe, bar and karaoke place are nearby. 24 hours/everywhere Wi-Fi access, two common use computers, luggage storage, coffee, tea, seasoning, washing powder, shampoo, body soap, parking for motorcycle and bike. We are happy to store your luggage in the luggage room before check-in and after check-out. Longer-term luggage storage is available for returning guests. *Kitchen appliances (fridge, stove, oven, microwave, toaster, rice cooker, coffee maker) tableware, cooking utensils and seasoning. *Washing machine (200yen) and dryer (100yen/10 minutes), washing powder is free of charge. 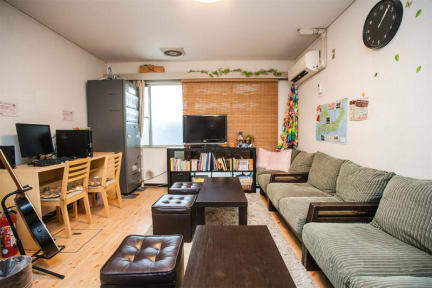 Japanese style room floored with tatami mats, air-conditioned and heated, toilet and lavatory, TV, low table, hair dryer. Japanese style room floored with tatami mats, air-conditioned and heated, toilet and bathroom (shampoo and body soap), bath towel, TV, low table, hair dryer. Western style room has 2 single beds, air-conditioned and heated, toilet and bathroom (shampoo and body soap), TV, bath towel, desk and chair, hair dryer. Western style room has a double sized bed, air-conditioned and heated, toilet and bathroom (shampoo and body soap), bath towel,TV, desk and chair, hair dryer. Japanese style room floored with tatami mats has 2 bunk beds, air-conditioned and heated, toilet and lavatory, TV, low table, hair dryer. Western style room has 2 bunk beds, air-conditioned and heated, toilet and bathroom (shampoo and body soap), hair dryer.